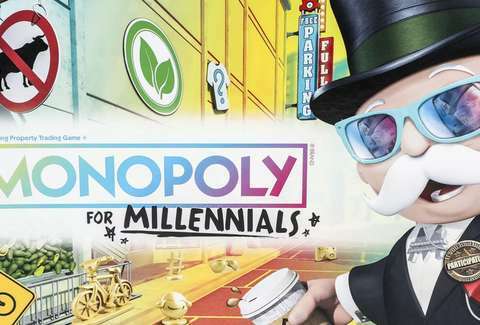 Up next in the roster of tired millennial-targeted jokes is Millennial Monopoly -- a deeply unappealing board game presented by a concerningly small old white guy with a monocle. Complete with a tagline that reads, "Forget real estate, you can't afford it anyway," the game promises to be even more divisive than your classic Monopoly edition, which has already earned itself a reputation for being the sort of game that shatters families, alters wills, and primes couples for divorce. "Money doesn't always buy a great time, but experiences, whether they're good -- or weird -- last forever," the product description reads. "The Monopoly for Millennials game celebrates just that." Instead of investing in Park Ave or B&O Railroad while you cruise through life (probably on a fixed gear bicycle), you'll get to spend your hard-earned influencer cash on so-called "super relatable" experiences, like a week-long meditation retreat, or a night on a friend's couch. Perhaps your designated banker will even accept payments via Venmo. "Adulting is hard," the box proclaims. "Take a break from the rat race with this edition of the Monopoly game." It's highly doubtful that anyone has ever referred to a round of Monopoly as a leisurely "break." This feels dramatically less likely when the entirety of the game is a joke for which you and your friends are the punchline. We’ve decided to play Millennial Monopoly, in which we try buy property on the Original set with money from the Junior set. To make things more fun, the instructions ask the player with the most debt to roll first -- so you're required to work through your financial demons out loud before you've even taken a turn. Typically, this is not a game night requirement. On the other hand, Hasbro quietly fails to address the decline of the job market, the real estate bubble, health insurance, or the president. As the cards detail, millennials are far too busy eating at vegan restaurants to spare much time for social justice movements or, say, crippling student loan payments. How refreshing! Being a millennial is like joining a game of monopoly after all the properties have been bought up. millennial monopoly: pass go, pay $200. Drawing on tired tropes centered around avocados and financial instability, the stereotypes embedded in the game will surely offend someone in the room. That said, if you're in need of a good cry, try passing go a few times. It might be just the form of #selfcare you need.